A lovely concoction of flowers and leaves in shades of pink. seafoam,green,gold and a fuschia swarovski cabuchon. All dangling from a non-tarnish brass chain. 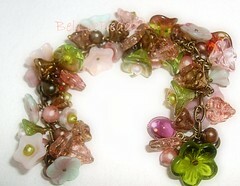 All flowers and leaves are czech glass whilst pearls are freshwater pearls. Ends with a toggle and measures approx 7.25"
ps - will retake this photo. Needless to say its my night photography which still needs to be fine tuned.